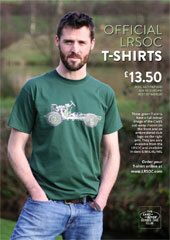 If you wish to enquire about postage discounts for multiple items, please contact the Club Shop directly. Specifically designed to complement your vehicle, this all new double brass-plated and enamel grille badge comes complete with fixings and spacers to sit flush with your front grille. Lacquered for extra protection against the elements, no Series One should be without one. Order now at the special price of just £16 for delivery to the UK or £20 for Europe/Rest of the World... remember to select the correct delivery address for overseas orders. 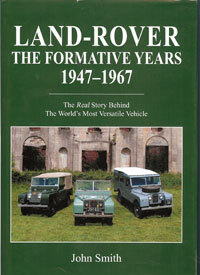 Specifically written for the 'Series One Land Rover enthusiast, and published in-house by the Land-Rover Series One Club, John Smith's book is the definitive volume covering the first 20 years of Land-Rover development. The book is in A4 format, and has 320 pages of text accompanied by some 500 factory photographs, drawings, and other illustrations. 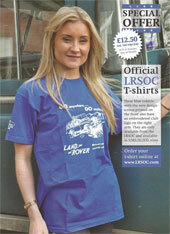 This lightweight polyester flag has been specially designed by LRSOC and incorporates the club logo. The size is 4' by 3' and the flag comes complete with suitable ties. Pole not included! Just £22.50 incl P&P to the UK or £25 incl P&P to anywhere else in the world... great for events or just to stand out from the crowd. 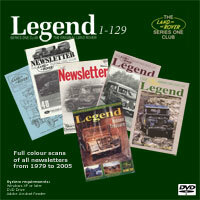 This DVD (for PC users) includes full colour scanned images in PDF format of every Newsletter and Legend magazine issued between 1979 and 2005. A separate Article Index is also included which enables users to search the contents to locate specific items of interest. A pack of 4 high quality printed greeting cards with images drawn by artist Louise Limb, the pack contains four separate images representing Series One vehicles working in over the four seasons. The cards are blank inside so you can use for whatever occasion you wish.